At first glance, it would seem that nothing changes in Cuba. The system seems to gently continue down its inexorable march toward a crash that, nevertheless, doesn’t seem to ever arrive, just like the future promised by the defunct revolution. People continue to do everything related to the three national occupations of the highest priority: subsistence, illegal activities and emigration, mired in a riverbed of static appearance in which each side is trying to achieve its own goals, as if they were independent of each other… As if they actually were. During the past four years the Cuban government has established the methodology of making up time by wasting it. Perhaps this has been the only political contribution of the General-President: a formula that is based on the accumulation of experiments emanating from a group of reforms and counter-reforms designed to create the expectation of economic changes without essentially changing anything, while time passes and circumstances continue to deteriorate. The closest thing to a government program in recent decades was endorsed in a few guidelines few had faith in and that no one seems to remember (including General R. Castro himself), whose “implementation” has turned into some incomplete and inadequate aberrations, such as the distribution of leasehold land to agricultural producers, the granting of licenses to the self-employed, the approval of sales or the donation of private homes and cars, and the expansion of the use of cellular phones, among other stunts. The most recent and spectacular official scripted act has been, without a doubt, the so-called “migration reform”, a kind of myth that has taken hold over large sectors of the Cuban population, eager to emigrate, a trick whereby the government passed the ball to the opposing field: starting January, 2013, ordinary Cubans who behave will be able to travel without requiring the humiliating exit permit. Instead, they will just have to apply for an extremely expensive passport. After that, it will all depend on the overseas destination conditionally extending a visa. Skill and ineptness combined into yet another perverse hand at a balancing act without giving up control. The giddiness that such a wealth of “change” should generate in a country whose characteristic permanent hallmark has been its resistance to change had barely a brief effect. While some journalists and foreign visitors think they see a sign of progress for Cubans in the official measures and the numerous street kiosks and carts, or an opening leading to the Island’s democratization, the fact is that there have been no real changes resulting in the improvement of life, the increase of the people’s capacity for consumption, or in palpable economic growth, not to mention the rights issue. The brief bubble of hope of early kiosk entrepreneurs has faded in the face of reality: prosperity is a crime in Cuba. This is reflected, for example, in the fact that agricultural production is still insufficient because of the many obstacles imposed on the peasants (including defaults on contracts by government entities, or the continuing delays in the same, bureaucratic obstacles, lack of guarantees to growers, the shortage of materials, etc..), while the proliferation of self-employed sellers engaged in the marketing of these products, far from bringing about a decline in prices of agricultural products — as would occur in a in a healthy and normal market — has caused a disproportionate rise in prices, shrinking the people’s purchasing power, especially of those in the lower income brackets. The formula is quite simple: about the same amount of goods and consumers, plus an increase in the number of sellers, results in an out-of-control rise in prices in a country where the State is unable to even meet the most minimum requirements of the more fragile and dependent sector of the population, while wages and pensions are purely symbolic. The issue of house sales is one of the more sensitive, due to the critical state of the housing market, as hundreds of thousands of families do not own their own homes. While it’s true that now those who own property may sell their homes, the difficulty consists in that few Cubans who do not have a roof over their heads have the means to acquire even the most modest apartment, though, compared with home prices in other countries, Cubans may, for the most part, be considered “moderate”. A similar picture is presented in the rest of the “liberated” activities in virtue of the so-called government reforms. In fact, each “liberalization” brings with it the implicit increase in the cost of living and extends the schism between the nouveau riche and the dispossessed, which is proof that the problem of Cuba lies in the very core of the system. Nothing will change as long as they don’t change the principles underpinning the regime. Consequently, the government won’t be the one that will promote changes that the country needs, because changing what needs to be changed would mean the downfall of the regime. Though this is a simple enough principle to explain, both the failure of the so-called Cuban socialism, strengthening of state capitalism established by the same class and the same “communist” subjects, architects of the national aberration for over half century, as well as the continuing and deepening socio-economic crisis, there is a kind of delicate sustained equilibrium in certain key factors that have prevented a social explosion, among which the following are significant: the state of permanent poverty which glaringly limits the expectation of great masses, who prefer escapism or survival rather than taking the risk of confronting the regime or of –- at least — not making things easier for the government; the lack of civic culture of the population; the still lack of development of independent civil society groups and their limited –- though growing– social influence; the use of repressive forces to harass any manifestation of freedom, and the monopoly of the media and communication by the government. Nevertheless, such equilibrium in an existence of supersaturated frustrations could tumble at any given moment. Sufficient for one component to exceed its limits for the landscape to be transformed, especially considering that the discontent is growing and the long contained frustrations are a depth charge in a society biased by fractures and inequalities. It is not only the steady growth of internal dissent and of other sectors that criticize the government. 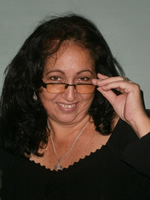 Migration, corruption, illegal activity and all expressions of escapism — including apathy and pretense — are all forms of dissent that now dominate almost the entire Cuban population, a fact that the government is aware of and seeks to control by applying the precision of the repressors: political persecution to civic activists by the minions of the so-called Section 21; economic persecution of producers and traders through corrupt inspectors of the Comptroller. The growing frustration on the Island is the seven-headed Hydra lurking between dark crevices of a structure that stands on miraculous static, and whose balancing should, right now, be the General’s utmost concern. Note to readers: As you may have noticed, I am making changes to this page little by little. I hope you forgive some slips due to my faulty connectivity (which slows down the process of updating the image in the new template), compounded by my lack of mastery of the technology. Anyway, I’ll keep updating the posts at least once a week … Don’t give up on me. Thanks.. Hugs. Since the evening of Wednesday, November 7th, independent civil society activist Antonio Rodiles has been detained at the police station on Acosta Avenue, in the Havana municipality of Diez de Octubre. It was reported that he was beaten in the face and other parts of the body, and has been without food or water demanding his freedom. One of the henchmen threatened him by raking his gun against Rodiles’s head… not surprising, given the rich Latin American dictatorial tradition of the impeccable military uniforms. Of thirty-some arrests that took place last week, only Rodiles is still locked up. It is said that the authorities are accusing him of contempt, resisting arrest, and, more recently, it is presumed that they seek to prosecute him for a more serious crime: assault. The intention is clear: we must imprison the leader of the idea that is causing the generalship to lose sleep. Those of us who know Antonio Rodiles and are committed to his civic cause know that so much official cynicism is the effect of the Cuban government’s fears of the claims of peaceful opponents. The campaign Por Otra Cuba — For Another Cuba — which collects signatures of hundreds of Cubans demanding the ratification of the Covenants for Rights signed by the authorities February 2008, is a threat to the immunity of a totalitarianism that has dominated Cuba for more than five decades. The moral force of dissent and the experiences of hundreds of decent Cuban over the years, seem to filter down to the spirit of resistance that has hatched among broad sectors of society and is taking shape in the consolidation of citizen projects such as the Estado de SATS, the Cuban Juridical Association, the bloggers’ platform Voces Cubanas, the Razones Ciudadanas project, the group OMNI Zona Franca and many others of different tendencies but with a common goal: a democratic Cuba. The oppressors’ fear is so great that the police station where Rodiles continues to be confined is protected by a strong operation to prevent the development of groups to demand the prisoner’s release. They know that he is not alone; dozens of his traveling companions are waiting for him and keep a constant demand for his release. It should also be noted that it is not necessary that we plant ourselves before a den of thugs to continue our peaceful struggle. The Demand is being signed, reluctantly, by other Cubans who are becoming more aware. The people’s yearning for freedom cannot be contained, that is why repression is achieving the opposite effect when it attempts to quell the rebellion by means of terror. We should strongly oppose the conspiracy. 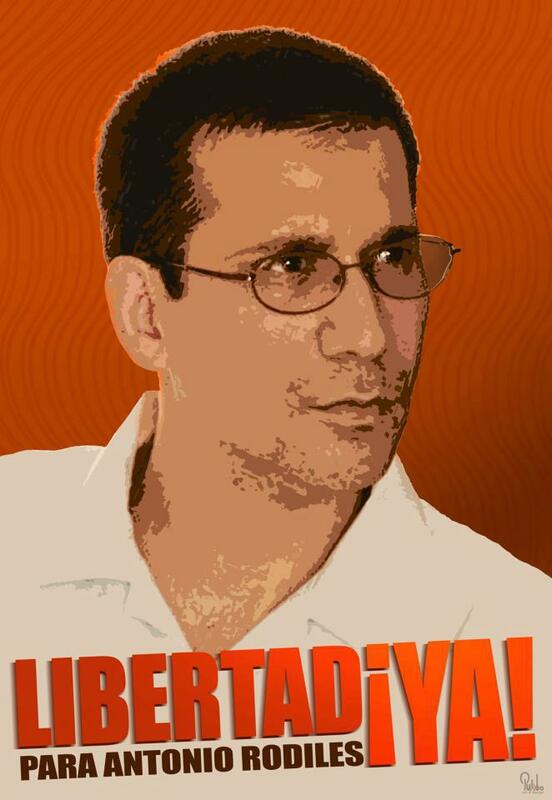 Freedom for Antonio Rodiles. The Covenants of Rights must be ratified. At a polling place: “See? no cheating… at least in the ballot box.” Photo taken from an official site. The results of the ballots –the so-called “elections”- in Cuba this past October 21st were reported in the official media as a demonstration of the people’s loyalty to the Revolution, which is to say, an example of allegiance to the government. Nothing new in that discourse. Every two and a half years, there is a repetition of the choreography in which government and “voters” play their role in the comedy, pretending to do their part: the former, holding elections, the latter, making choices. Although this time the process featured more apathy than usual on the part of the voters, and the authorities were less irksome with propaganda, and even stopped the usual practice of niggling voters by sending Pioneers to insistently knock on doors of the most unlikely to go out and cast their votes, attendance figures again placed above 90%, as befits any self-respecting totalitarian regime. 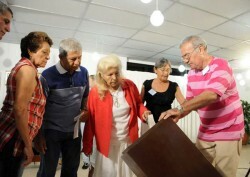 However, even if we gave credence to the official data, the number of dissenters was clearly endorsed at 1,161,431 Cubans of voting age who did not go to the polls, invalidated their ballots, or left them blank, three sufficiently clear ways to at least protest the lack of confidence in the system by a significant number of the population. At any rate, the fear of retaliation and the zombie effect continue to be the norm in the population. A few days after the elections, I decided to make inquiries among voters in some neighborhoods of three of the more densely populated municipalities in the capital: Cerro, Diez de Octubre, and Centro Habana. Knowing how impossible it would be to organize a formal and complete survey, I thought it more expeditious to assume the position of a fellow citizen innocently seeking information needed for a personal matter, and to improvise, according to the situation. My objective was to confirm what we all know, including voters who vote in an effective manner, that is, those individuals whose ballots are valid upon scrutiny, because they vote for only one of the candidates for delegate districts, they do so automatically. Even so, most of those who consider themselves party to the system ignore even the most basic information of their “elected”. Do you know who the district delegate is, his name, address, how I can get in touch with him and his schedule to meet with his constituents? Did you vote for the elected delegate? How do you get in touch with the delegate? Only one housewife could give me a half-answer for the first question, because the delegate lived in her building, though she didn’t know where or when he held office hours. The rest, people would tell me they did vote –except in one case, when an individual answered, with some suspicion, that he was away on that day, and he wasn’t very communicative- though nobody could tell me with any certainty the name of their delegate, let alone his address or how to get in touch with him. Only three individuals told me that the candidate they voted for had been elected, but couldn’t quite remember his information (last names, address, etc.) “I think his name was Juan Luis or something like that”, “I think he lives in the green building around the corner” were some of the most accurate information I found. Other descriptions were even ambiguous: “He is military, bald-headed”, “Yes, of course, he’s a mulatto who hobbles a bit when he walks, but I don’t remember his name or where he lives.” As can be seen, people have a high political sense and a close bond with their representatives, as proclaimed in the official media. As far as my many relatives and friends, close or not-so-close, the pattern was of similar behavior, though, of course, no one was reluctant to answer. Only one person admits voting for a delegate (a valid ballot), though he has no idea of his name or who the guy is. The rest voided their ballot with “D” or crossed it out. A smaller group and I did not go to the polls. Certainly, my little “survey” is not worth any official purpose, but I invite any Cuban to verify for himself the truth in what I say. One does not have to be very sharp in his questionnaire. Any question about what led an individual to vote for one or another of the candidates, or about the nature of his expectations will immediately raise suspicions on the part of the surveyed and will only produce evasive answers. We have had over 5 decades of fear, and a lot of people still seem to sense a guardian dog of the regime behind any other Cuban. But they will be able to see without doubt that the official discourse stands on a scaffold so fragile that it would not withstand even the simplest poll of any agency qualified for such purposes. Of course, a makeshift Cuban pollster would also run the risk of approaching the wrong person. He could stumble onto the most zealous “combatant” on the block, the one who sees “the enemy” behind the most innocuous question, and then the person conducting the survey might spend a night in a dungeon and get out after signing a “memorandum of warning “as punishment. I must confess that I’ve been lucky, or maybe the snitches and the Talibans are waning. I don’t know. That would be another kind of survey, that, I have to admit, I still don’t dare to perform. These last few days a deep feeling of guilt keeps gnawing at me. Caesar, my oldest grandson, told me, in a strong tone of accusation, that I had lied to him. He said, and I quote, “Grandma, you lied to me, school is not at all as you said it would be”. The worst part of it is that he is right: I unwittingly shortchanged him when I set out to prepare him for his initiation into the world of school. Let me share this with you. 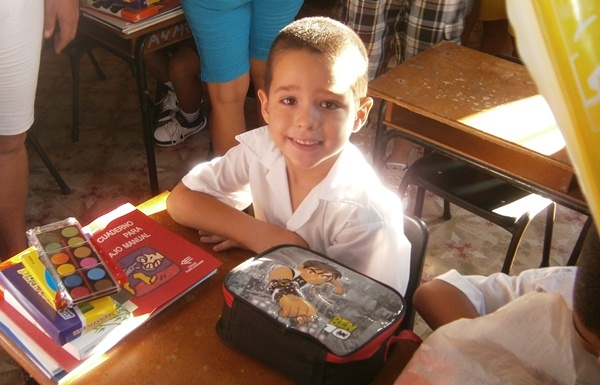 Cesar is 5, and he started preschool this year in a Sevillano Development school, municipality of Diez de Octubre in Havana. Members of the family around him had begun to prepare him during the summer months for this new phase of his life where whole days of play and cartoons at home in the company of his mother would soon become a thing of his past, as he would start to spend long hours sitting in a classroom, subjected to the discipline that learning and the socialization process would entail, surrounded by classmates of very diverse personalities. We had also all contributed to his complete school wardrobe and materials. The school would be -we told him- a wonderful learning experience and he would learn new games, make new friends, the teacher would instruct him in very interesting things, and he would learn new songs which he would sing along with the other children. He would make clay figures and build houses, ships and rockets with the construction games in class. We wanted, with the best of intentions, for our kid to sail smoothly and devoid of trauma through this necessary rite of passage that is crucial in a life of a child. I, especially, have great influence on him and tell him many stories he always listens to, spellbound, of my own happy childhood and that of his father. I described the school in a world of color still alive in my imagination, immune to the destruction and sham of the system. I didn’t lie to my grandson when I spoke to him about the school universe I discovered when I was four years old in September, 1963. Back then, my father worked at the sulfo-metals plant in Santa Lucia, Pinar del Rio, where I attended the first of my 11 elementary schools throughout most of Cuba. My preschool teacher, Nela, is truly an unforgettable character to this date. In that small town’s classroom there was a real piano played by the same teacher to accompany the many songs I still remember in all their details. There were balls, toys, puppets, modeling clay and coloring pencils. We learned with little effort, singing and playing, under the guidance of that sweet kind lady whom we all loved and respected. I didn’t lie to Cesar when I told him about the school his father, my oldest son, attended. I was more excited than he was when he started school in September of 1984. We lived in Old Havana, my home town, and though his preschool classroom also had an old upright piano, the teacher was not able to play it (by then teachers did not know how to play) and there were not as many toys as in my classroom 20 years before, but at least there was the traditional modeling clay, construction games, and children learned through song. In addition, Hildita was a loving teacher whose small frame was full of tenderness and patience, and whose warmth and imagination replaced, to some extent, some of the material shortages at the school. I know my son remembers Hildita with the same appreciation and affection as I remember Nela. It is not surprising, therefore, that the night before the start of school Cesar was not able to get to sleep at his regular time. He would recheck his backpack to see that nothing was missing, he would put on and take off his uniform until his mother had to put it away so it would not get dirty, and he would keep asking how long before morning would arrive. At 6:30 AM he was already up, nervous and excited, and earlier than 8 o’clock he was already at the school yard with many of other preschoolers who were as happy and proud as he was. That was two months ago, and Cesar’s teacher has been in the classroom for a total of one week. They say that she “has personal problems”, “a diabetic sister in Camagüey”, or “an elderly mother”. This may all be true, but it does not excuse the school administrators for not having sought a substitute teacher. Instead, a teaching assistant tries to keep up appearances, putting the kids through one task and then another. It’s the only way to report officially that the school curriculum is being met, and that all children are getting an education in Cuba. In the meantime, however, Cesar’s preschool is far from the expectations I planted. No games and songs, no modeling clay or toys. No one can say with certainty when the teacher will return, or how long she will be in class before once again she has personal problems that are more important than her job. Teachers are an endangered species in a country that has seen the destruction of a long educational tradition dating back to colonial times. The ethics of a profession, beautiful by its very nature, has been lost. So my grandson Caesar no longer wants to go to school, and holds against me what he considers my lies. I explained to him that everything I told him before was true, so he has proposed a solution: “look, grandma, you’d better take me to your school and have your teacher teach me”. I thought about Nela, who by now is probably dead, since she was already no youngster in 1963. Her memory may have made clear the idea that surfaced: “I’d better teach you right here, at home”. It’s not as crazy as it sounds, because my first profession was teaching. So for a time now Cesar wastes his time at school Monday through Fridays, and on weekends I teach him the alphabet, numbers, we review the colors, draw, play with modeling clay, cut out geometric shapes and recite and sing my old preschool songs. We also have storytelling sessions so he will soon become interested in learning to read, and we put aside an afternoon to take relaxing walks. This way, I make sure that he’s learning, and at the same time, I will try to overcome my terrible feelings of guilt. Note: All names and situations referred to in the text are strictly real.